Whipple Superchargers have released some brand new images of their 2015 Mustang Superchargers! When it comes to supercharging a Mustang, few do it as big as Whipple Superchargers, and they have big plans for the 2015 Mustang. Some people were a little let down by the 2015 Mustang Horsepower Ratings, but don’t lose hope yet as Whipple has stepped up to the plate to give the S550 a big bump in power! Whipple Superchargers has been hard at work making aftermarket parts for the 2015 Mustang for months now, as they attended an invite-only event at Ford along with other aftermarket manufacturers like Forgestar, to take measurements and get CAD data for the S550 Mustang. Whipple has even had a 2015 Mustang in their possession to do R&D on, allowing them to perfect their new superchargers for the new Mustang. 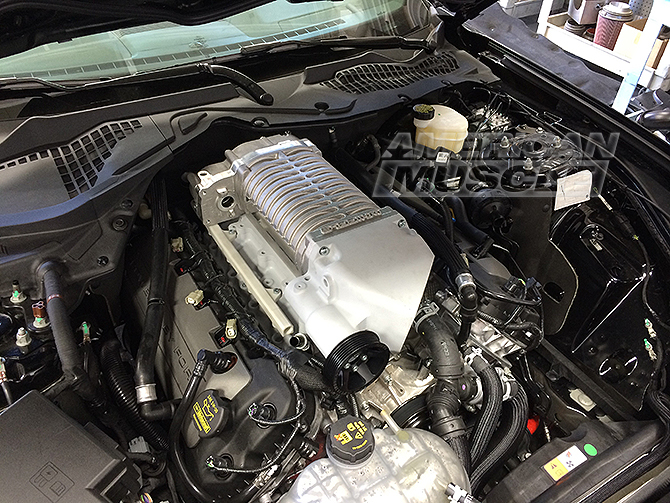 What’s Different about Whipple’s 2015 Mustang Superchargers? The most strikingly obvious is the variety of colors you can get a Whipple Supercharger in. Expanding upon the old chrome or black colors is a wide variety of colors such as red, blue, yellow, and even gold! Backing up the new look is a 2.9L front fed intake design which will be putting down around 700 HP on the 2015 coyote engine. The best part of it all is for a little bit more money you can buy a warranty from Whipple to back up your big power. That is an offer you do not see a lot of supercharger companies offering. Coming as a little bit of a surprise to blue oval enthusiasts, Whipple is no longer the Ford Racing Supercharger of choice. Ford Racing has teamed up with Roush to offer Roush Superchargers as a Ford Racing Product, making 2015 the first year they are not using Whipple’s design. Regardless, Whipple is sure to a community favorite as they always have been, with their intoxicating blower whine and huge power gains that are warrantied. Ford, by their marketing and business plans, have all but publicly stated that the 3.7L’s days are numbered. It’s a nice motor and it does get going, but it doesn’t take kindly to lots of boost (>550bhp) (due to being an economic compromise between fast and cheap). So there’s little interest in making a power adder for it, especially when so many people just opt to buy a V8 once they get bored. After all, if there really was that much interest in it, there’d be more people buying the few kits available, showing off them off, and more being made. But there just isn’t. agree, at least until some sort of false gas crunch comes again. then the V6 will be more viable. I think ford would have been more wise just to have put the 3.5 eco-boost in the base cars as part of their performance package. that would have been a better choice, use the better flywheel and 1 piece drive shaft, then it would have been a chevy and dodge killer, like the gt. . I do know that the V6 car is a very consistent runner, with soft launches and short shifting around 6250 easy shift so as not to hurt the light weight MT-82 the car ran a 5 passes all at 14.4 with no more than .005 difference. so for bracket racing it just as good as any other car. I have met numerous people running the V6 cars in road racing, they like it for the lower curb weight, but wish there was more power options for courses with long straights. just wish there were a few more factory and aftermarket options that didn’t require a super high end pro shop to install. and a 500 hp V6 car is nothing to sneeze at. I remember not to long ago 500 hp on the street was a feat only Big block cars achieved. There has been a hp war going on between the American domestic auto makers for some time now, and the 3.7L N/A or Ecoboost 3.7L as good as it is, just won’t cut it for Ford’s top of the line performance car/engine. Having multiple high performance engines in the same car when there is going to be multiple high performance V8 based cars like the GT350, possible GT500, possible 5.2L GT350, and others is a lot. It’s already been leaked that there will definitely be a GT350, and GT350R in 2015. Plus the aftermarket knows that the V6’s days are numbered just like J said. Putting the EcoBoost V6 as the base engine would have added too much money to the base model to make it even an option for Ford, especially since it would make it more powerful than the 4 cylinder Ecoboost, making that the base car. Which would be cool to Mustang enthusiasts, but they have people at Ford who are responsible for keeping the base car’s price down low enough ($24k) to be a huge seller for the average person who likes Mustangs, and for rental car agencies etc, and they are great cars, a lot better than they used to be, but Ford needs to sell a lot of them, and if it’s a twin turbo that’s $5k more, the average person, or rental agencies aren’t going to buy it, ruining their sales predictions. Before all it was good for is the non Mustang enthusiast and rental car agencies and that’s it, it’s a lot better than that now, but still the base model. Having 3-5 high performance Mustangs as their main lineup just isn’t going to happen. There has to be a base model and like J said has it’s days numbered, and they’ll come up with another base engine to use. So for now it is a great engine for the Mustang’s base model. The aftermarket isn’t going to make expensive blower systems for a car that isn’t going to be using that engine much longer, it’s not like the Fox Body Mustang, which made the Mustang the most modified car ever made, or factory equipped blower cars that can benefit from a better supercharger, or V8 Mustang owners that buy tons of them because they race them constantly and always want to go faster. When someone who really wants to go fast in a Mustang goes to buy one, they don’t even think of buying the V6, that’s just the way it is. That’s not a put down, it’s just a fact. There’s not enough money in it for the aftermarket companies to spend that much money, research and development, etc. to justify building supercharger kits for that engine. And honestly if you really want to spend that much money for a complete air to liquid Kenne Bell or Whipple supercharger kit, that’s more than enough to have a good shop design and install a custom twin turbo kit for a V6 Mustang, something I’d much rather have than a blower. The aftermarket is really only interested in spending a lot of money on designing. and building supercharger kits that will be bought in masses, that means owners of V8 Mustangs who want to go a lot faster, SVT Cobras, or Shelby GT500s, etc. The number of people who would by the same kit for a base V6 Mustang is tiny compared to the others, that’s why. The supercharger companies have their own war going on trying to be the one to make the most power and be the biggest seller to Ford, and Mustang enthusiasts with V8 Mustangs, cause you’re not gonna make 700-1200 hp with a base V6 engine, you can with a V8 Coyote GT, or GT500 for the higher number. If there was enough of a want from Mustang owners for V6 supercharger kits, they would build them, they do a lot of research before they make anything. Why would anyone buy a v6 mustang in the first place? Clearly you don’t know much with the horsepower and torque the v6’s have been putting out its more than most v8’s including most older mustangs v8’s not to mention the more bang for your dollar….. I mean you buy a v6 with 300chp for 24-25000 and put 6k for forced induction with a good 93 tune your looking at 470whp and 510wtq which for 31000 is about 19000 less than the gt and the new ecoboost is well good but nothing without another 10-15k. Cause unfortunately some pony car lover dont have $48,000, like my poor self. I did want the V8 but figured, I am 23 years old and a 23 year old kid with 2015 mustang V6 or not, is still impressive, and i also thought if anything i can put a supercharger on it to keeo up with the stock V8. But that was just my story. Ford is treating the V6’s as the redheaded step child in favor for the Eco Boost or V8. That’s why we sold my wife’s 99 and got her a 2004 Cobra, I’d would have preferred something a little newer for her daily driver (110 miles a day) but she loves the New Edge body style. The V6 is rental car spec duty. But with this new Coyote V8 having the BOSS ( roadrunner engine), block, is now rated upto 1000hp vs 600 hp in the 2011-14′ Coyote. This will be a force to reckon with. Glad I got rid of my 2012 SRT8, which was after my 2009 GT500. My 2013 5.0 stock is as fast as my 2012 475 hp SRT8 was in a straight line despite 50+ hp less. 700 lbs less weight has a lot to do with it. I wanted agile, athletic, fun, good mpg’s and the 13′ 5.0 provides that. Something the big fat heavy SRT Chally just can’t touch. The SRT products are for the guys that went from 25 yrs old and fit to 40 and fat couch potatoes. The mustangs are for the guys that are still fit like they were at 25… Oh, and after talking to many engineers at Dodge, those V8’s are NOT legit hemis. The names copywrites were purchased to use by dodge for marketing. And, after going to a few private viewings of the new Hellcat and seeing it run barely 12 sec flat at 122 mph, driven by very experienced street & 1/4 mi drivers, it makes me want this new 5.0 even more. Sure, the HC is $61k but that does not include the required $15k deposit to order one, of which 5k goes towards the cost. So your really going to be paying 75-80k for a SRT HC, and that’s IF you can get it near MSRP, not the typical dealer mark up of $8-14k.. Ford Racing is officially the first to get their own new 2015 5.0 with long tubes, a tune and Offroad exhaust (no mufflers basically), with a few suspension tweaks, and slicks on 17″ wheels, to run 11.7@117 mph in late fall heat (83 degrees and 70% humidity) at a track that’s 1200 ft above sealevel with a DA of 2100 ft…. That 11.7 is a even run with a HC on drag radials getting smacked in the whiskers. Ford has struck back again with the, “less is more” philosophy. Smaller 5.0 engine, 475hp, 650 lbs lighter, better mpg’s, out handes a BOSS or a viper on a road course and overall gets the job done much more efficiently. I’m 42 and wouldn’t touch a Mopar, sometimes I think the younger guys forget who started this war of horsepower and its not the 20 somethings. It was people like my father and his generation. The war between Ford, Dodge, Chevy has little to do with age. I remember a time not to long ago when it was usually fat white chicks driving the Mustangs or at least that was what was said. Fat What girls still do drive Mustangs! It seems to be a very common car with them! Lucky for me, and my Mustang when it hets here, I can’t get my weight past 115! Don’t get me wrong, I’m not bashing “fat people”. But if you have issues on bigger vehicles, WHY get a Mustang, Camaro, Corvette, etc.!? Just to be sure there wasn’t any misunderstanding my statement at the end of my original post wasn’t mine but rather the all to often comment made by non Ford drivers. I do think the logic of buying a small car when you’re 200+ pounds makes little sense. I came up watching my father, uncles and older relatives racing each other a real run what you’ve brung (I know its spelled bring but that’s not the way its said in this version). I also recall my father telling me he grew up watching his relatives. The thing that gets me the most is that the vast majority of these 20 somethings couldn’t tell you the first thing about mechanics. It’s no longer the driver/builder hobby, instead its how much are you willing to finance? I drive the model Mustang I like the most, I built whats under the hood. I admit I had my transmission built (I’d only mess it up). Every modification short of that I installed, I fabricated. I leave financing $50-$60 grand to my wife who prefers all that electronic crap. That’s not to say I have less then that in my Mustang far from it. I did however save my money, worked extra construction jobs and paid good old cash. No Credit Cards or personal loans. I came up being told you’ll value what you had to work for far more then just making the payments. Insurance is cheaper even when I’ve itemized each and every part. If it gets a scratch I’m not to upset I can do body work/paint. Much of what I’ve learned wasn’t to make money but to save it. Why pay some shop $50 an hour and jack up the parts cost? I relent if I don’t this post will never end. I hope you have or will learn to do it yourself. Win or loose at least your the one that built it. Finally you don’t have to risk you warranty to add a supercharger.